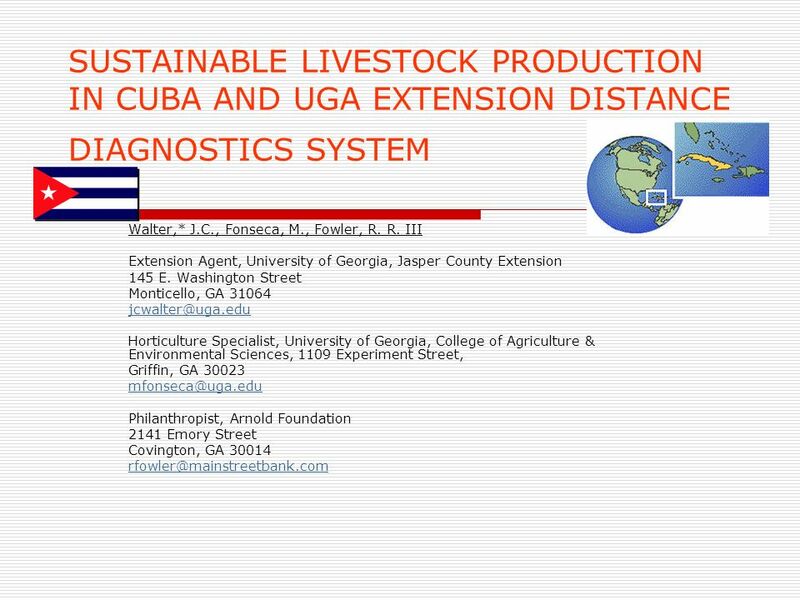 2 SUSTAINABLE LIVESTOCK PRODUCTION IN CUBA AND UGA EXTENSION DISTANCE DIAGNOSTICS SYSTEM Walter*, J.C.,1, Fonseca, M. 2; Fowler, R.R. III,3 1 A&NR Extension Agent, University of Georgia College of Agriculture and Environmental Sciences, Jasper County, Monticello, Georgia Extension Horticulture Specialist, State Master Gardener Coordinator, UGA-CAES, 1109 Experiment Street, Griffin, GA UGA-DDDI Consortium member, P.O. Box 1098, Covington, GA 30015 ABSTRACT Subsequent to invitation by Dr. Pepe Morales of Institute of Animal Improvement, Havana, Cuba, three UGA –Distance Diagnostics through Digital Imaging (DDDI) Consortium members with international sustainable agriculture interest and experience in Central America, attended the"SIGA 2004" (II Simposio Internacional sobre Ganaderia Agroecologica: Evento y Gira de Estudios "Agroecologia en Cuba de Oriente a Occidente") symposium. 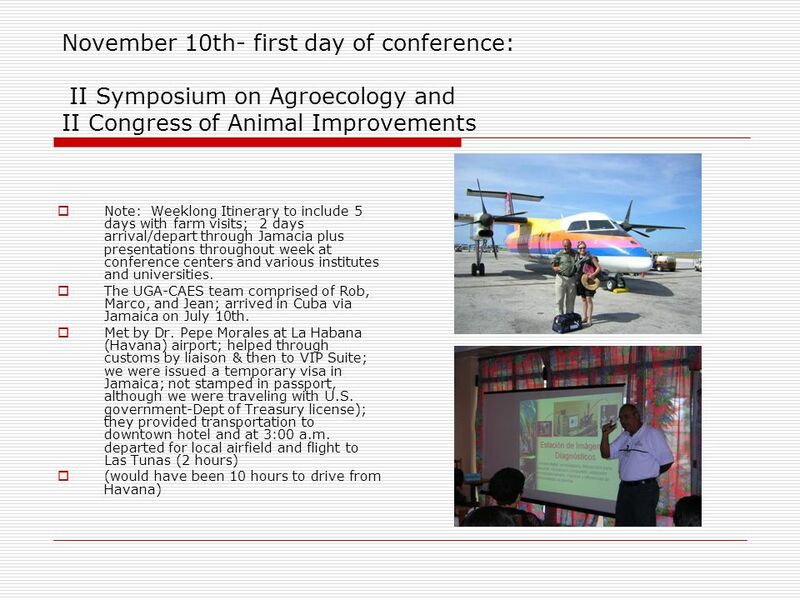 Over 20 countries were represented from as far away as South Africa and Argentina; the 62 registered conference/tour participants included numerous Cuban producers and scientists. 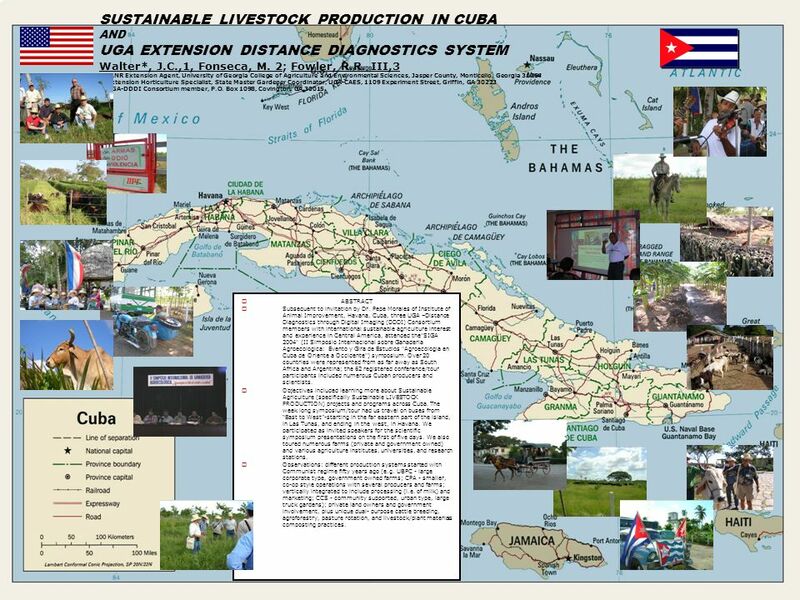 Objectives included learning more about Sustainable Agriculture (specifically Sustainable LIVESTOCK PRODUCTION) projects and programs across Cuba. 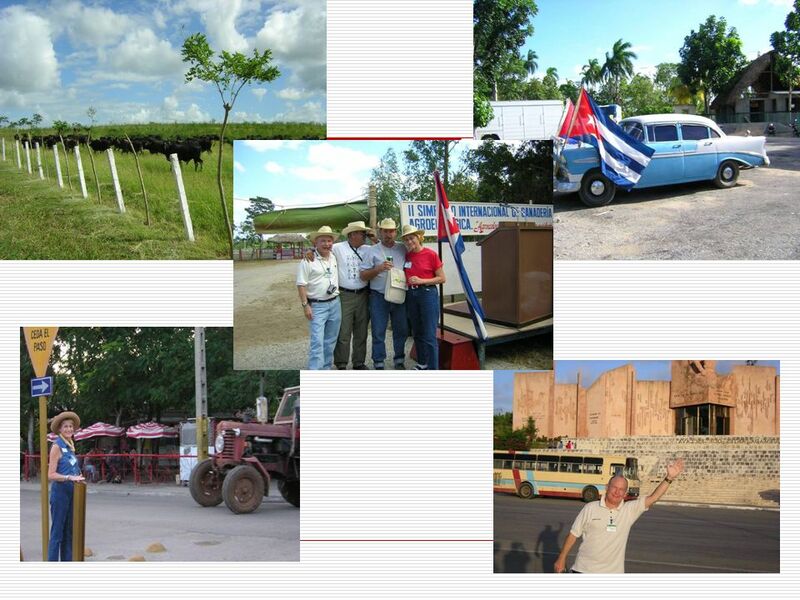 The week long symposium/tour had us travel on buses from “East to West”-starting in the far eastern part of the island, in Las Tunas, and ending in the west, in Havana. We participated as invited speakers for the scientific symposium presentations on the first of five days. We also toured numerous farms (private and government owned) and various agriculture institutes, universities, and research stations. Observations: different production systems started with Communist regime fifty years ago (e.g. UBPC - large corporate type, government owned farms; CPA - smaller, co-op style operations with several producers and farms; vertically integrated to include processing (i.e. of milk) and marketing; CCS - community supported, urban type, large truck gardens); private land owners and government involvement, plus unique dual- purpose cattle breeding, agroforestry, pasture rotation, and livestock/plant materials composting practices. 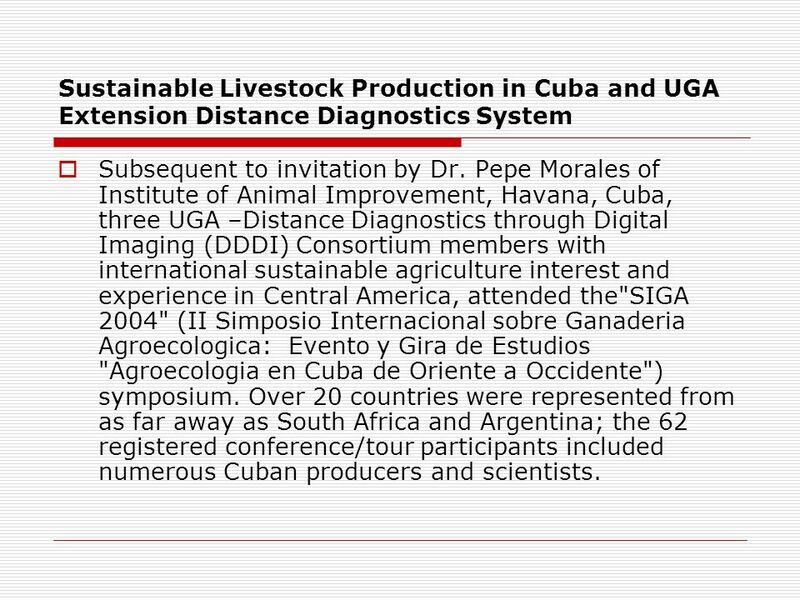 Subsequent to invitation by Dr. Pepe Morales of Institute of Animal Improvement, Havana, Cuba, three UGA –Distance Diagnostics through Digital Imaging (DDDI) Consortium members with international sustainable agriculture interest and experience in Central America, attended the"SIGA 2004" (II Simposio Internacional sobre Ganaderia Agroecologica: Evento y Gira de Estudios "Agroecologia en Cuba de Oriente a Occidente") symposium. 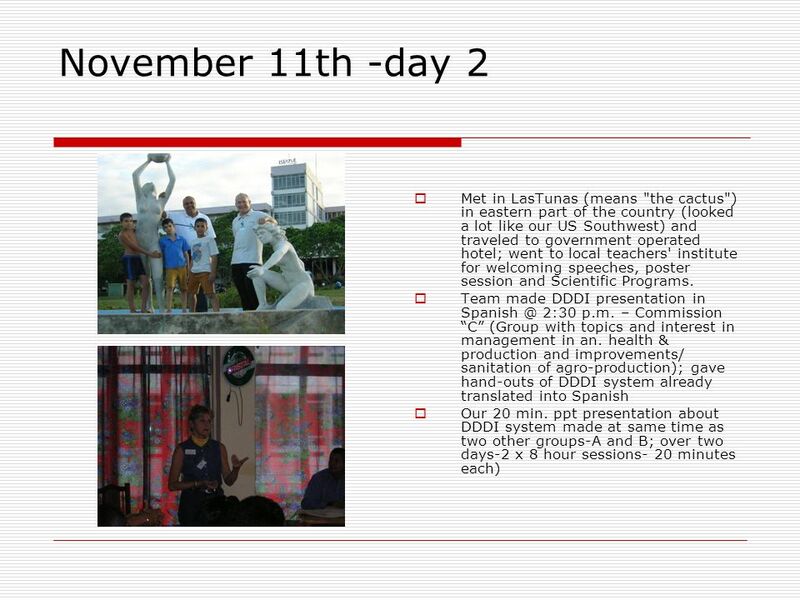 Over 20 countries were represented from as far away as South Africa and Argentina; the 62 registered conference/tour participants included numerous Cuban producers and scientists. 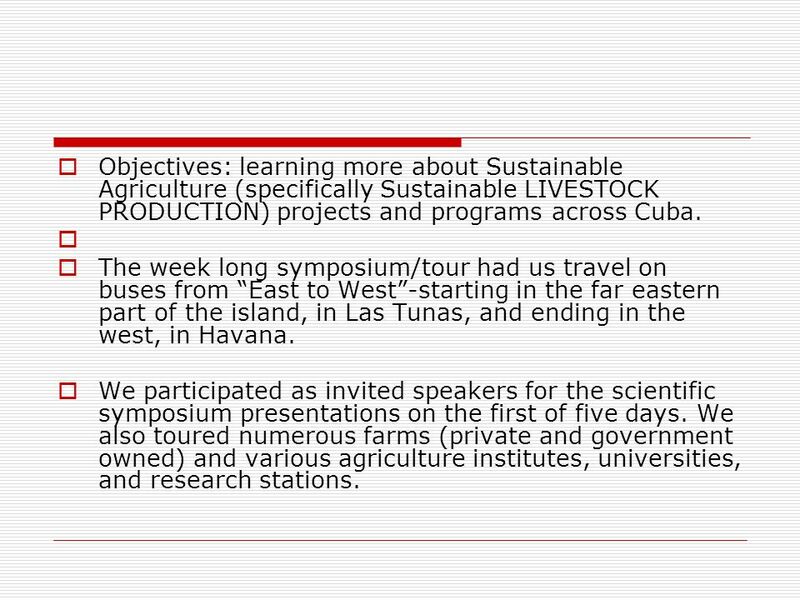 5 Objectives: learning more about Sustainable Agriculture (specifically Sustainable LIVESTOCK PRODUCTION) projects and programs across Cuba. The week long symposium/tour had us travel on buses from “East to West”-starting in the far eastern part of the island, in Las Tunas, and ending in the west, in Havana. We participated as invited speakers for the scientific symposium presentations on the first of five days. We also toured numerous farms (private and government owned) and various agriculture institutes, universities, and research stations. 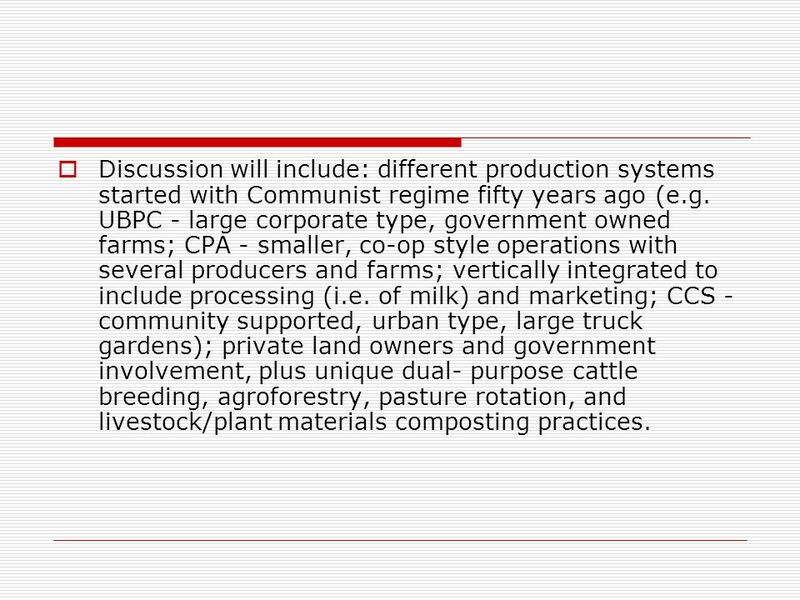 6 Discussion will include: different production systems started with Communist regime fifty years ago (e.g. UBPC - large corporate type, government owned farms; CPA - smaller, co-op style operations with several producers and farms; vertically integrated to include processing (i.e. of milk) and marketing; CCS - community supported, urban type, large truck gardens); private land owners and government involvement, plus unique dual- purpose cattle breeding, agroforestry, pasture rotation, and livestock/plant materials composting practices. 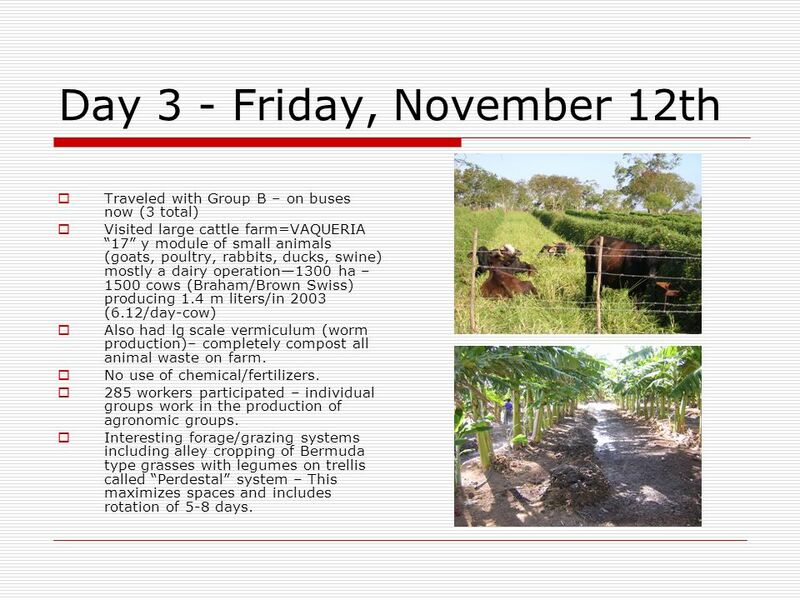 Traveled with Group B – on buses now (3 total) Visited large cattle farm=VAQUERIA “17” y module of small animals (goats, poultry, rabbits, ducks, swine) mostly a dairy operation—1300 ha – 1500 cows (Braham/Brown Swiss) producing 1.4 m liters/in 2003 (6.12/day-cow) Also had lg scale vermiculum (worm production)– completely compost all animal waste on farm. No use of chemical/fertilizers. 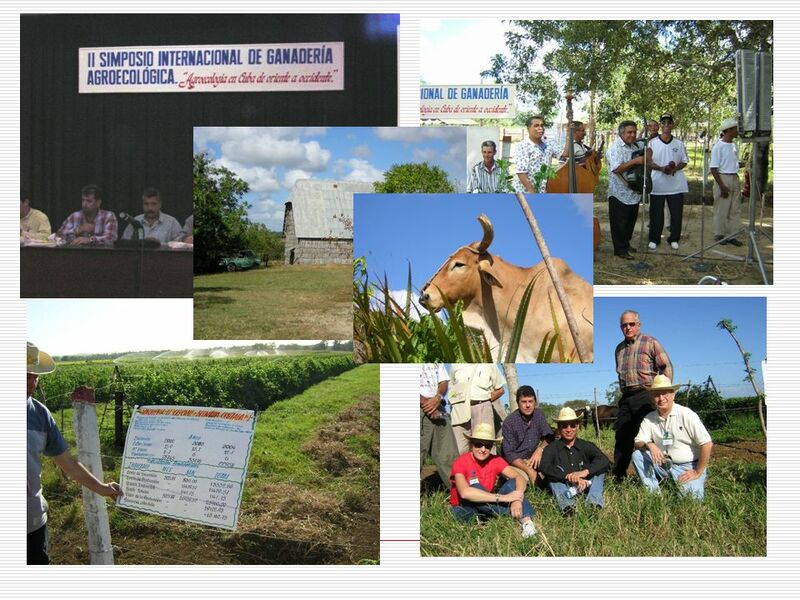 285 workers participated – individual groups work in the production of agronomic groups. Interesting forage/grazing systems including alley cropping of Bermuda type grasses with legumes on trellis called “Perdestal” system – This maximizes spaces and includes rotation of 5-8 days. Traveled to Camaguey. “The city of big clay water pigs” Visited “Represa 1” – a very large cattle ranch(grass vs grain feed lot)called "Empressa Pecana de Cuba Rectangulo”-finishing on rangeland; divided into blocks 1-2 HA larges with combination of Bermuda and legueme (Leucaena leucocephala cv. ); doing much A.I. breeding of Brahman and Brown Swiss and other breeds for dual purpose (milk and beef). Local ranchers put on small rodeo with calf roping and bull riding for us to see. 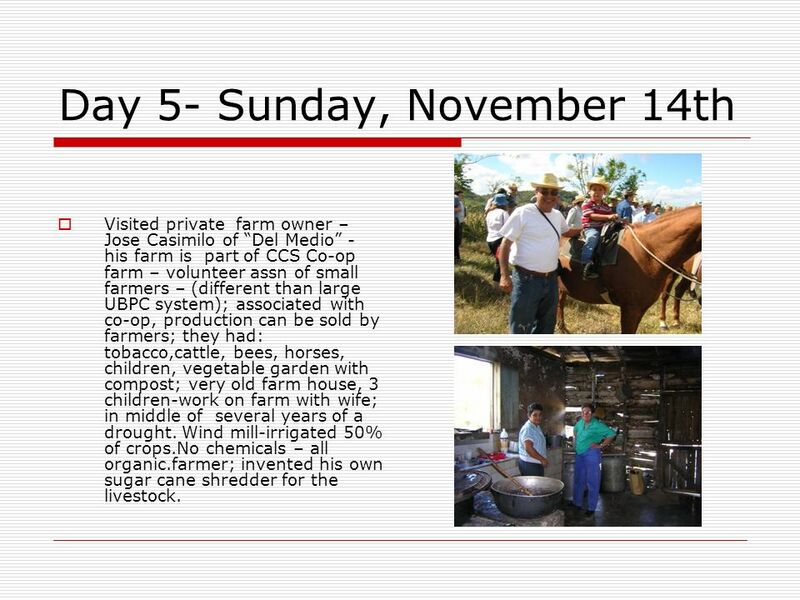 Visited private farm owner – Jose Casimilo of “Del Medio” - his farm is part of CCS Co-op farm – volunteer assn of small farmers – (different than large UBPC system); associated with co-op, production can be sold by farmers; they had: tobacco,cattle, bees, horses, children, vegetable garden with compost; very old farm house, 3 children-work on farm with wife; in middle of several years of a drought. Wind mill-irrigated 50% of crops.No chemicals – all organic.farmer; invented his own sugar cane shredder for the livestock. 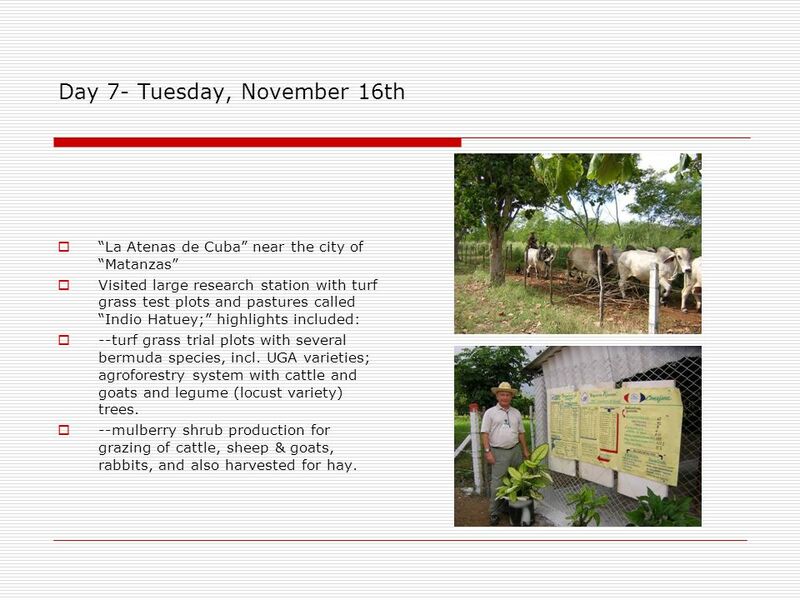 “La Atenas de Cuba” near the city of “Matanzas” Visited large research station with turf grass test plots and pastures called “Indio Hatuey;” highlights included: --turf grass trial plots with several bermuda species, incl. UGA varieties; agroforestry system with cattle and goats and legume (locust variety) trees. --mulberry shrub production for grazing of cattle, sheep & goats, rabbits, and also harvested for hay. 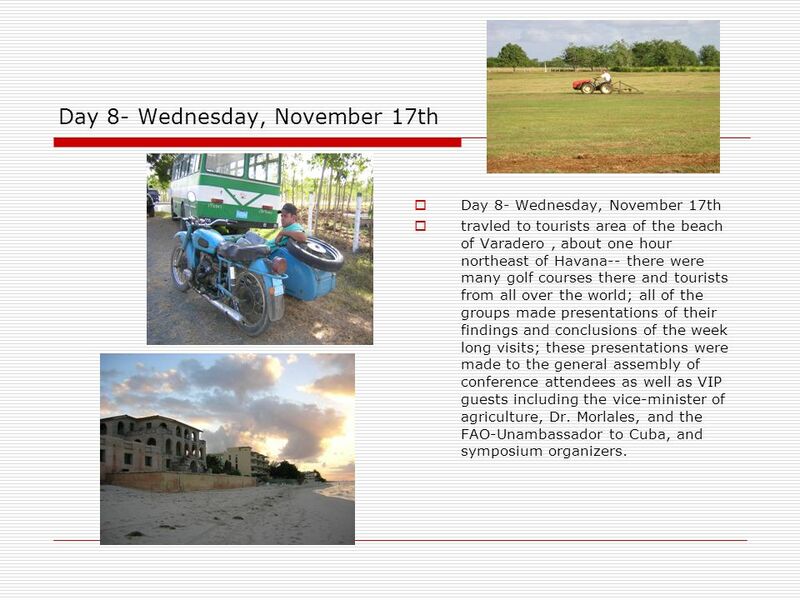 travled to tourists area of the beach of Varadero , about one hour northeast of Havana-- there were many golf courses there and tourists from all over the world; all of the groups made presentations of their findings and conclusions of the week long visits; these presentations were made to the general assembly of conference attendees as well as VIP guests including the vice-minister of agriculture, Dr. Morlales, and the FAO-Unambassador to Cuba, and symposium organizers. 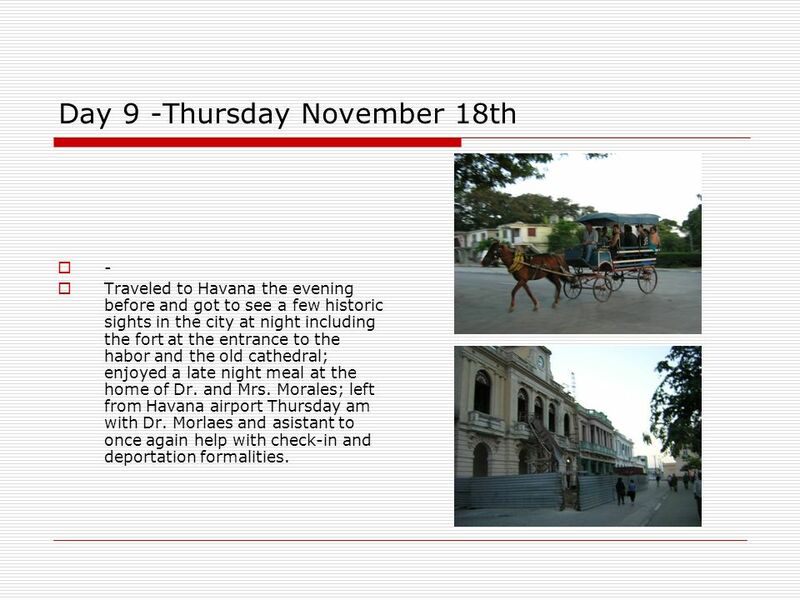 Traveled to Havana the evening before and got to see a few historic sights in the city at night including the fort at the entrance to the habor and the old cathedral; enjoyed a late night meal at the home of Dr. and Mrs. Morales; left from Havana airport Thursday am with Dr. Morlaes and asistant to once again help with check-in and deportation formalities. Download ppt "Walter,* J.C., Fonseca, M., Fowler, R. R. III"
The American Distance Education Consortium 65 U.S. State Universities and Land Grant Colleges. Chapter 11 Lesson 2 Test –Friday, April 30, 2010. XII Congress of ESA 20 – 24 August 2012 Helsinki, Finland 1. Unit B1-3 Animal Science and the Industry. Problem Area 1 Understanding the Animal Science Industry. Australian City Farms & Community Gardens Network Australia's community gardens… Innovative places……. To grow communities To. 12th International Symposium on Soil and Plant Analysis Chania, Crete June 5-10, 2011. CHRISTIAN FARMING AND LAND MANAGEMENT... BY REV EUSTACE.K. KABUI PRESBYTERIAN CHURCH OF EAST AFRICA. Enterprise Ideas Sustainable Small Acreage Farming & Ranching Cinda Williams UI Extension 2005. A is for animals. There are lots of animals on the farm. 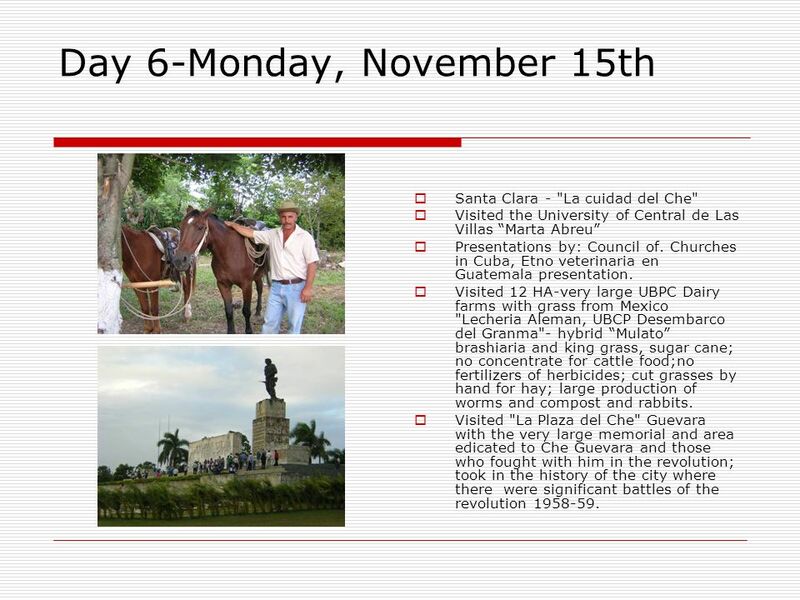 From a conventional agriculture system to a system of self sustaining management practices: the case of Cuba. Culture and Economic Systems  ***An economic system consists of 3 components Livelihood or production- making good or money Consumption- using up goods. Von Thünen ’ s Model. Von Thünen 1783-1850 German Farmer Amateur Economist Model translated into English in 1966.